I love playing TriPeaks Solitaire game from Microsoft Solitaire Collection and want to share tips and tricks for TriPeaks Solitaire game. In this game guide, I tried to collect some useful tips for TriPeaks game players like me hoping they will also benefit from these. If you like the card games on Windows PC and a real fan player of Solitaire and FreeCell games, you will love the surprise for Windows 10 users. For Windows 10 users who have not discovered Microsoft Solitaire Collection yet, it is on your PC's Start Menu. 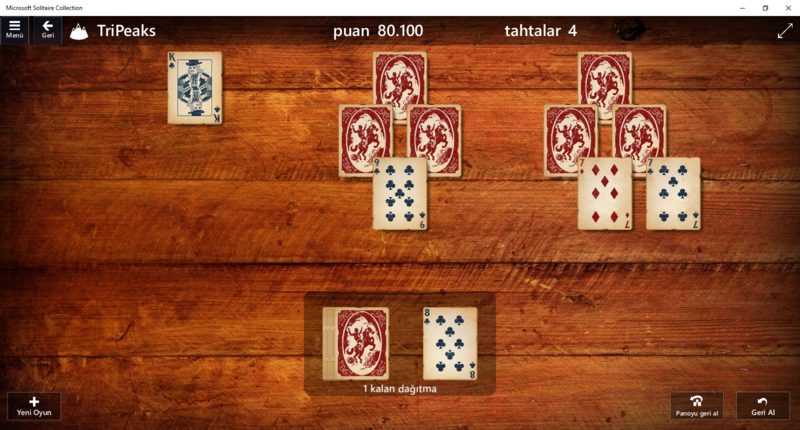 Solitaire game players can install Microsoft Solitaire Collection from Microsoft Store too. 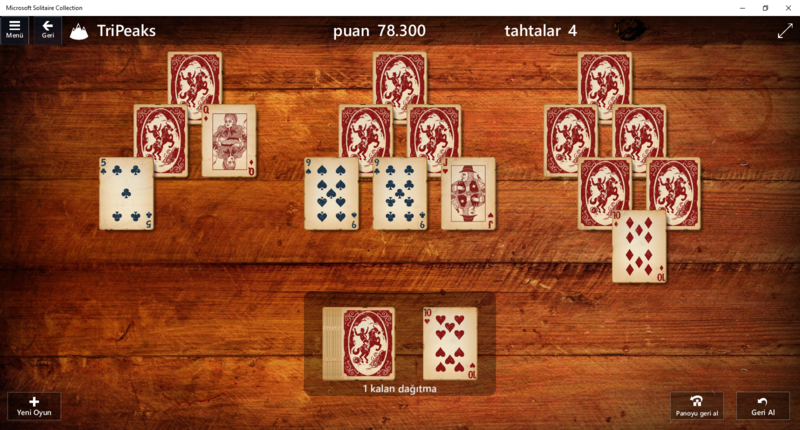 Besides TriPeaks, Microsoft Solitaire Collection incluldes Klondike, Spider, FreeCell and Pyramid. If you are playing TriPeaks, you have more options when more cards on the board are open instead of laying closed. While playing TriPeaks every movement of yours changes the flow of the game causing sometimes a stuck game where you have less options of cards to play on the board. If you do the correct moves to increase the number of open cards on the board, the the game flows easily. For example, in following game board the player has the option of picking 9 or picking one of the 7s. If you have such a layout, which card will you pick? If you pick the 9, you will have two new cards showing their numbers which are freed after 9 is taken out on the game board. If you pick 7 of Clubs (Clover), no new cards will be freed. That is the worst move and the last option for a player to choose. If you pick 7 of Diamonds, only one card will be freed. It is good to have a new open card on the board so you may collect it in future moves. But as the analysis shows, this option is not the best option on this TriPeaks board at the moment. TriPeaks is live. The TriPeaks game board changes permanently. Each board placement deserves a seperate analysis to take the best actions. Is this explanation too complex? Let me be more explicit. Every move on the game board introduces new options for the player for his/her next actions. So look for a better action after every card you pick on the board. It is certain, the freed cards may introduce new paths to score higher in TriPeaks game. Instead of picking 4 from the board. After I pick 6, I realized that the freed card locked by 6 was a new 5! So what was our TriPeaks tip, think once more after every move. Instead of continuing with picking up 7, I can change my plan to take recently freed card 5 and then 4 in order. So I can collect one more card from the board. Choose the right picking cards order. If you are an advanced Solitaire player, you already know how important it is to collect the cards on board in a suitable order. For example in below board, make your choice among picking 9 (which of the two 9s) or picking J first. Be sure, I know sometimes it does not make sense in which order you start collecting your cards, upwards or downwars. Because there is a circular cycle in some cases. But in other cases, you end up with one or less cards remained on the game board. The result of this analysis shows that in best scenario we can collect 4 cards and open 3 cards on the board. Why not choose it? 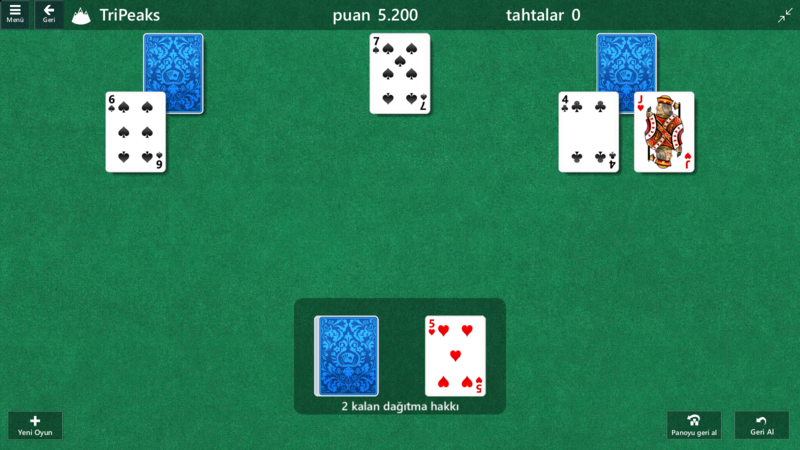 In other cases, if the player chooses other card picking orders, he or she can collect less cards and will not be able to turn more cards laying on the board. Following game video is interesting and worth to watch showing this rule in action.